Patty headed home to Kansas by plane Thursday, July 23, after going missing south of Port Orchard on July 4. After Paul Sawatski arrived at the Tacoma Narrows Bridge toll booth and realized that his dog Patty was missing from the back of the truck, her leash and collar dangling over the side of the vehicle, he spent three days searching for her along Highway 16 without success. 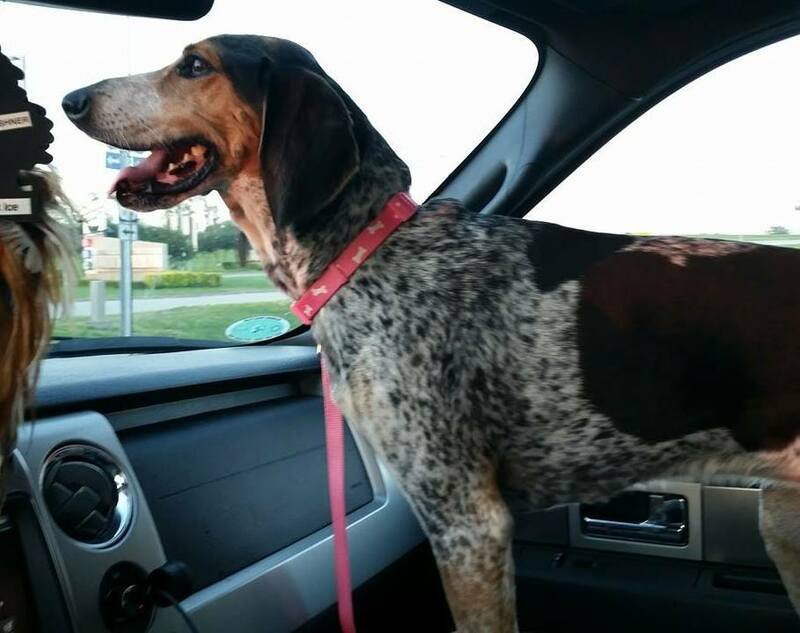 More than a week after Sawatski returned to Kansas, several Kitsap County locals continued the search for Patty, a six-year-old hound dog Sawatski has had since she was seven weeks old, he said. Patty was eventually caught in a live trap with the help of Julie Saavedra, of Bremerton, on July 18, and arrived back in Kansas July 23, almost three weeks after she went missing. “She clicked her little paws three times and back to Kansas she went,” Saavedra said. The dog was in good health when she was found, she added. And Patty is now back to lounging on the bed at home, Sawatski said. Sawatski and his fiancé Jessica Mahler were driving back to Kansas after visiting family in Kitsap County during the Fourth of July. Sawatski grew up in Seabeck and now lives in Wichita, Kan.
Patty and Jessica both dislike fire works, so Sawatski said he decided to take them and their other two dogs — Charlie and Franklin — to camp grounds were fireworks were not allowed. Somewhere between the Tremont Street exit and the Tacoma Narrows Bridge on Highway 16, Sawatski said he thinks Patty must have jumped out, something she has never done before. “No one honked. I didn’t hear anything hit the truck,” he said. Sawatski and Mahler spent the Fourth of July driving up and down Highway 16 looking for Patty. There was no sign of the dog in the road, which kept Sawatski hopeful, he said. The couple stayed through the weekend searching and contacting local humane societies. Mahler flew back to Kansas for work on Monday and Sawatski stay an extra day to search for Patty. People would call Saavedra or Sawatski when they sighted the dog, narrowing where she could be found. After several reported sightings around the Purdy Crescent Road exit, Saavedra set a live trap with a cooked steak, chew toy and T-shirt that Sawatski mailed her. The hope was that Sawatski’s scent would bring the hound dog into the trap, Saavedra said. “I think the steak had something to do with it too,” Sawatski said.